Manzara Honten is located about a 5 minute walk to the north from Kyoto Shiyakusho-mae subway station. Contrary to a vibrant main street, a relaxed Japanese space can be found here in Manzara Honten. This is a refined restaurant that boasts its great atmosphere, where you can casually enjoy authentic creative Japanese cuisine a la carte. Manzara Honten was created by renovating a traditional townhouse from the Taisho period. If you walk past the beautifully maintained courtyard toward the back, you will see a spacious private dining room that was renovated from a storehouse. You can feel Kyoto’s elegance and history from the entire restaurant. The cuisine is all authentic, and you can savor creative Japanese dishes carefully crafted by the owner with love. The specialties of “homemade sablefish saikyoyaki” and “namafu dengaku” go very well with sake. Why not enjoy the combination of sake and recommended dishes. The staffs are very friendly and kind, so you can visit it in relief. This restaurant abounds with hospitality. Please go and feel it in your heart. *It is necessary to place a reservation through the hotel concierge. Namafu dengaku is one of Manzara Honten’s specialties. Namafu is originated in Kyoto and essential for Kyoto cuisine. Its chewy texture similar to mochi has slightly sweet flavor, which goes very well with dengaku miso. This dish is one of the most commonly ordered dishes. As its round, bite-sized appearance is very cute, it is especially popular among women. This is a must-eat dish while in Kyoto. Vegetables on the dish are always at their best. Not only hot tempura sauce but also matcha salt, shrimp salt, and Chinese pepper add spice to tempura. More than anything, the large shrimp is unbelievably delicious. The shrimp meat is juicy and slightly sweet, but the batter is crispy. Just dip it in broth smelling sauce, it is definitely superb. The staff will recommend sake in accordance with your taste. Manzara Honten always usually stocks with about 10 kinds of local sake, and the kinds change slightly depending on the day. The sake in the photo is a local sake from Kyoto and also an original sake from Manzara-tei called 京まんざら / Kyo Manzara. Its slightly dry and smooth taste goes well with any cuisine. Enjoy a combination of sake and cuisine that can only be served depending on season! What we would like to introduce is the homemade mabo tofu using yahei chili peppers. The chicken broth and Szechuan peppers used in this dish are all made by hand. That warms your heart. Maybe because you can feel their cordiality, this mabo tofu, made with time and effort, is not as spicy as you would expect. By savoring the spiciness that approaches slowly, you are sure to completely appreciate the deliciousness of this mabo tofu! It’s sure that it carefully please your stomach! You must try their original pot mabo tofu! 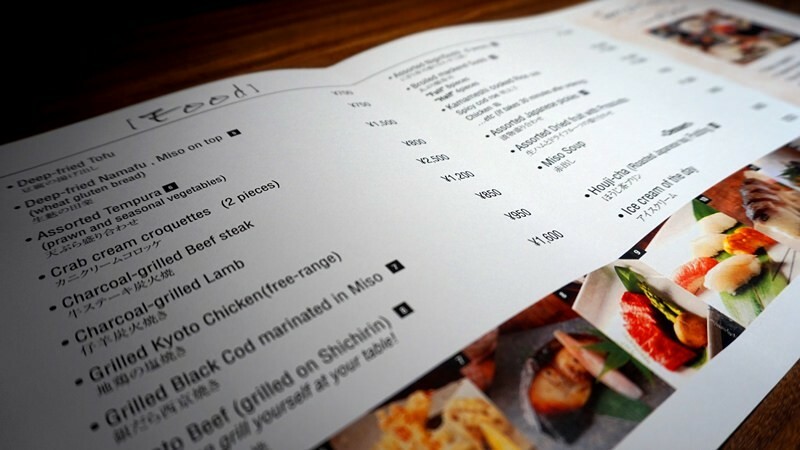 An English menu is available for international visitors, but not all menu items are written in English. If you have any questions, please ask the staff! 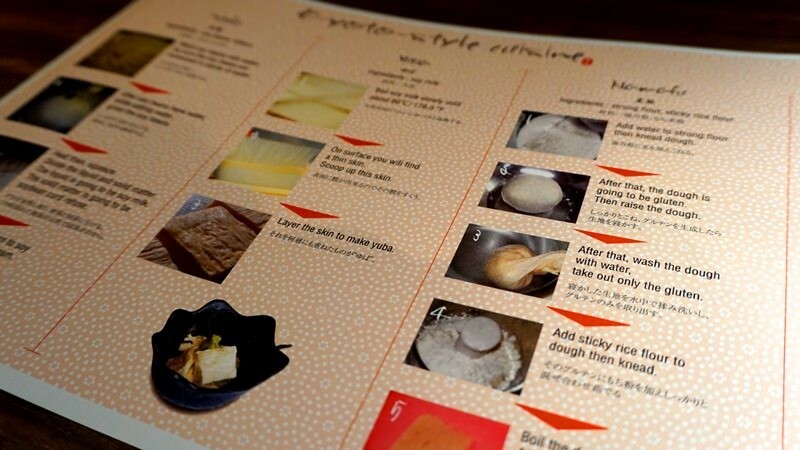 Together with the English menu, they will provide an illustration explaining how the traditional Kyoto cuisine items of yuba, tofu, and namafu are made. Please enjoy reading this while waiting for your meal served! It may be nice to go out to a courtyard at the back of counter seats. Especially in the evening, when it starts to get dark, the courtyard is fantastic. That makes you feel like you are spending the time in a beautiful ryokan. Enjoy Manzara Honten from head to toe, you cannot wait your time even a minute. This is a fun restaurant where you can casually enjoy delicious Japanese cuisine in downtown Kyoto. The people at the restaurants are very friendly and talk to you nicely, so there is no doubt that both your mind and body will be satisfied! The atmosphere is also excellent, so you don’t miss it if you would like to feel “Wa” (Japanese heart). As they serve several types of local sake from Kyoto, please enjoy Kyoto’s unique sake by all means as a celebration of your trip! Manzara-tei are popular creative Japanese restaurants located in Kyoto. Since many hotels are near it. This Manzara Honten is very popular among tourists from overseas and Japan. The staff abound with hospitality and can speak English. If you would like to enjoy casual a la carte Japanese dishes, not Kaiseki cuisine, Manzara Honten. 5-minute walk from Subway Tozai Line Kyoto Shiyakusho-mae Stn. 5-minute walk from Subway Karasuma Line Marutamachi Stn. Must make a reservation. It’s available only through your hotel concierge. Must be on time for your reservation. Do not cancel on the day. As an English menu is available, you can go in a natural way. Also, there are English speakers. They will welcome you with hospitality and gestures. 8 counter seats at the bar counter. 16 seats on the floor with space that allows you to stretch your legs. Maximum 30 table seats on the 2nd floor.